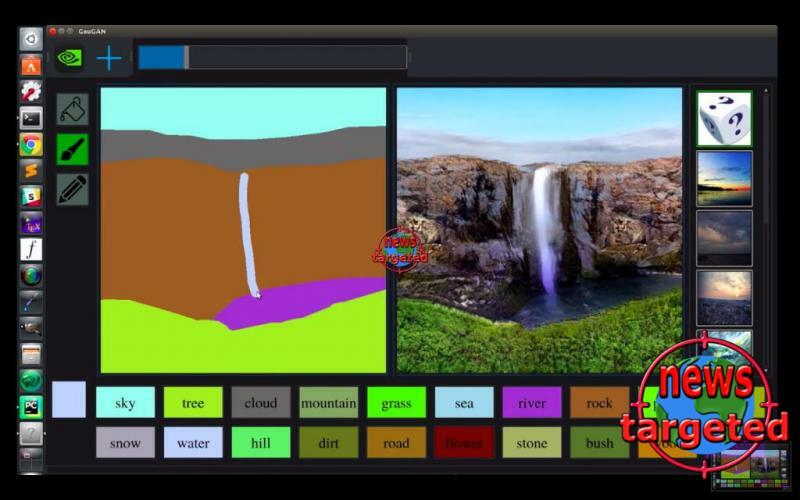 During yesterday's NVIDIA GTC 2019, the company presented a very exciting project which is named GauGAN and which represents MS Paint in the AI age. GauGAN is a kind of drawing program that uses Nvidia's neural network platforms to turn a simple sketch into an almost photorealistic image in no more than a few seconds. In the little presentation shown, it is very impressive how Nvidia has managed to use artificial intelligence in a new way. The interface looks very simple: one finds brush and pencil as well as a number of objects on the bottom where one can, for example, tick off a cloud-like object and then create photorealistic clouds according to their own formations. Nvidia points out that this is not about pre-printed images that are printed, but that the tool produces completely unique results as a result of user input. According to TechCrunch, the company has processed over one million images from Flickr to train the neural network. In order to have real-time results, Nvidia has been running on a Tensor platform, and the company even uses an RDX Titan GPU during the project presentation. Bryan Catanzaro in Nvidia nevertheless tells that the program with some modification will run on almost any platform - even with regular processors, but that the results will be somewhat slower in such cases. A commercial launch for GauGAN is not planned, but it is likely that Nvidia will open for a public test of the program so anyone can try it for themselves.